This is Spectator, he likes to watch the world go by. 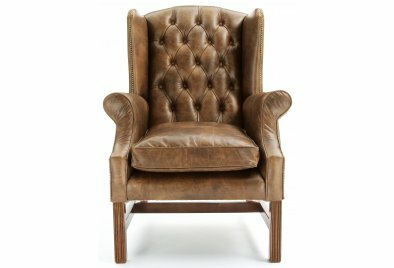 He's a proper Leather Wing Chair and has all the charming bits and bobs that you would expect. Beautiful proportions, lovely sprung back and deep hand-inserted buttons. His wings and side panels are hand studded and the fascias of his scooped arms are beautifully piped in leather. His seat cushion has a heart of foam to keep it neat and plumped, and a top layer of duck feathers which makes him even more of a joy to sit in. 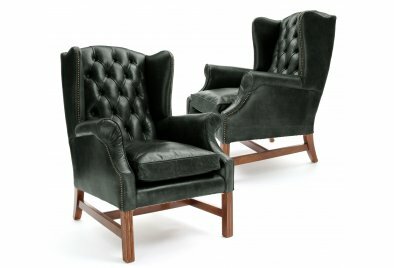 He's upholstered in Vintage Leather, the most worn-and-loved leather that we do which will make you want to take him home and watch the world go by together. If you like Spectator you should meet his Georgian brother Eton, words simply won't do this chap justice so just take a look for yourself.